Three major victories in the past two weeks should give heart to those who wonder whether we won’t be overwhelmed by corporate coal interests. First there is the decision by Whatcom County Planning and Development Services that Gateway Pacific applicant, SSA Marine must reapply for the Shorelines permit, that their initial application filed in 1997 did not address the possibility of their project being a coal port. The second major achievement in this struggle the Washington State Department of Ecology agreeing to Whatcom County’s request that the state co lead the adjudication of the Environmental Impact Statement concerning GPT. The third major decision concerns a parallel interest in the Tongue River Valley in Montana, where a BNSF rail project could transform a bucolic back country area into an industrial corridor. A 3 judge Panel of the 9th Circuit Court of Appeals held that the federal Surface Transportation Board had to reconsider and properly consider environmental impacts of running a coal train through the Tongue River Valley. The court was saying that in this case, mitigation of problems was putting the cart before the horse. The Panel’s decision lends strength to the safeguardthesouthfork concern that impacts on the Farm Land Route must be assessed in the EIS prior to permitting of GPT. Greeting Rick Larsen at the Deming Library, who will be commemorating the advancement of technological services for the library. Join us in politely congratulating him for taking the needs of county residents seriously. If you are pleased with the work that we are doing on your behalf write to us and offer your suggestions. Your support is always appreciated. The South Fork Valley Community Association’s [SFVCA] Annual Summer Celebration is on Saturday, July 16th. The fundraiser and community gathering is an opportunity for residents to meet and enjoy one another’s company. The event starts at noon at Josh Vander Yacht Park in Van Zandt, across Highway 9 from the Everybody’s Store. People are encouraged to bring a picnic lunch, lawn chairs, and a dish to share (if desired). There will be a fire going for people to cook on and local vegetables will be provided. Admission is free, but donations for the association, as well as Food Bank items will be collected for Local Food Works. At 4pm the annual Honoring Our Children event will be held, in which names of local children who have died are read aloud. Music starts at 5 pm beginning with Mockingbird, followed by Beet (a band featuring local teen girls), and then BandZandt will play its blues and rock until dusk. SGSF will have an information table at the event. Please consider joining the party this year and celebrating the life and people that make up the picturesque region of the South Fork Valley. 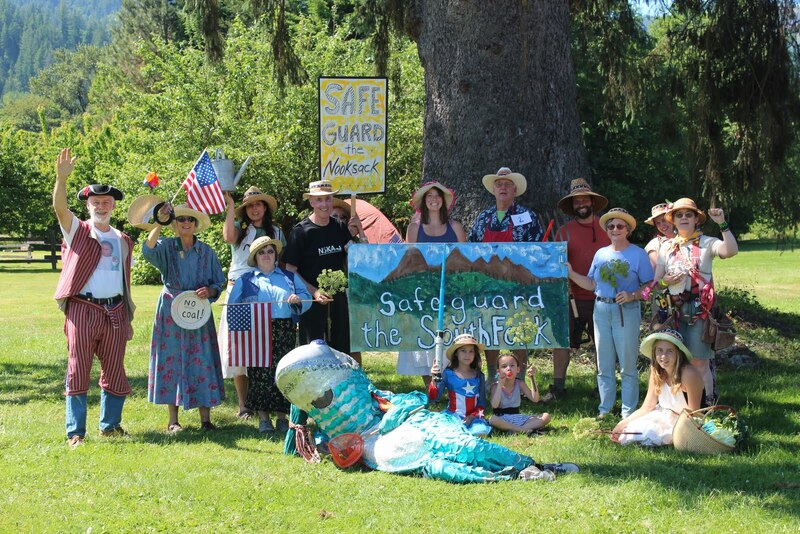 Thanks for all the support SafeGuard the South Fork received at the Acme parade on the 4th of July. We were honored to receive the Community Spirit Award amidst such a beautiful community! Whatcom County residents need to realize that the majority of Bellingham folk and its economic development community prefer to see the “Coal Train” go anywhere but through Bellingham. If you think the “Coal Train” will absolutely go up the coast and an alternative roundabout farmland route to the Cherry Point Gateway Pacific Terminal (GPT) is impossible, then you need to improve your chess game. Gee whiz, the spokeswoman for BNSF Railway told Mayor Pike that the Coal Train was destined to go through Bellingham? And didn’t Ken Opplinger, president of the Bellingham Chamber of Commerce helplessly declare that those trains headed to British Columbia were going through Bellingham one way or another. We are being played by BNSF. Forget what apologist Opplinger swears to, because coal trains to Canada are easily routed through Great Falls Montana from the coal fields in Wyoming. If you want the truth ask the Great Falls police, who dealt with 13 derailed coal cars returning from BC at 3:00 AM October 14, 2010. BNSF has a problem coping with “diminished capacity”. Anticipating an exploding Asian appetite for coal via GPT, with an additional twenty to thirty trains per day over and above its daily freight and passenger service, their single track from Mt. Vernon to Bellingham is a choke point destined for expansion should GPT be approved. For this reason alone people living along the Farm Land Route in Whatcom County have something to worry about. BNSF may assert that Bellingham is the only route and the alternative route: Skagit County, the South Fork Valley, Sumas, Lynden and Ferndale is uncalled for, but those who safeguard the South Fork Valley know they do as they please. Do they dare eschew the Farm Land route in writing? Over a 20 year period BNSF, old hand that it is in getting its way, cleverly used “delayed stage timing” as a tactic to sidestep environmental review of its Tongue River Project in Montana, thus transforming a once bucolic farmland into an industrial nightmare. It could happen here.and it is realistic to ensure that this alternative route be included in any environmental review of GPT. Whether the train goes through Bellingham or the Farm Land route all of us will have to engage these environmental challenges. Unique to the Farm Land route however will be the modernization of the rail and highway corridor from Wickersham to Ferndale. Today there are 91 public railroad crossings throughout Whatcom County. Unless this county is to look like a third world country most of these crossings will be upgraded with improved warning lights and gates. In many cases, especially along Hwy 9, overpasses will be the only solution for the prompt passage of emergency vehicles. Indeed the whole state faces this problem. It was Senator, then Representative Doug Ericksen, (the current candidate for Whatcom County Executive ) whose Transportation Committee ten years ago, enthusiastically commissioned the study for “Commerce Corridor” from Sumas to Tenino. This was a dry run for what confronts us today. To the sponsor’s surprise the study concluded that this highway/rail project was basically unaffordable and unacceptable. To wit, numerous environmental issues, one for example in the South Fork Valley above the Samish River headwaters was insurmountable. The Commerce Corridor study never attempted to envision the long term impact on the people along the corridor. Although building overpasses at critical intersections would necessarily obliterate a few small towns, causing some dislocation and create the need for relocating and redeveloping, Acme, Van Zandt and Nooksack, the study did not anticipate the infrastructure and zoning changes that it could trigger. It all came under the heading of progress. Please do not forget that some of the politicians and local business people who supported the proposed Commerce Corridor that would have ripped up the rural South Fork Valley/Acme area and transformed it from a 2-land highway into an 8-lane mega highway/rail transport system, now support the proposed Gateway Pacific Terminal at Cherry Point. Don’t let anyone fool you. I hope you will write about the politicians running for County Executive and their views on the old Commerce Corridor plans and the current Gateway Pacific Terminal project, and just who is behind the funding of this Terminal. The advertising says it’s a Washington State company, but 49 percent of the company is owned by Goldman Sachs, one of the companies involved in our country’s financial crisis. We need to keep our country rural, beautiful and clean, while providing good local jobs for people living here; not jobs for people who will be moving in to fill those jobs. Please report of these serious key issues, especially as the election nears, and I urge residents to do some research on their own. This past Friday, Earth Justice, the attorneys who sued Ambre Energy for attempting to circumvent the environmental scoping process in Cowlitz County which resulted in withdrawal of the permit application there, gave notice to Whatcom County that SSA’s permit application is incomplete because it does not ask for a new shoreline permit. The letter is here.The county has until Friday, June 23, to complete its review of the application and determine whether it is complete or should be returned to SSA. If Whatcom County Planning Division does not follow state law governing revised Shoreline Substantial Development Permits, it is possible that the county will be met with a lawsuit it would cost this county scarce resources to defend their administrative position. Please consider expressing your opinion to Tyler Schroeder (360-676-6907,techroed@cc.whatcom.wa.us) at Whatcom County Planning & Development Services. Tyler is one of the primary decision makers in charge of the application review. If you feel inclined, you may also contact the county executive: Pete Kremen (pkremen@co.whatcom.wa.us, 360-676-6717). RESources has some great information available on the importance of taking action during this stage of the process. Proponents of the Gateway Pacific Terminal have asked people to withhold judgments against the process until a thorough EIS review is complete.So what should we make of SSA Marine trying to subvert the process that they encourage us to trust? Here is a copy of the letter by Earth Justice on behalf of Climate Solutions, Sierra Club and RE Sources sent to Whatcom County in response to Pacific International Terminals (SSA Marine’s) filing of a Major Project Permit and a “Shoreline Substantial Development Permit ” this past week (6/17/11). Simply put, filing to “revise” a fourteen year old permit attempts to circumvent the law by trying to portray a 300 times larger footprint of the terminal with a 600% volume increase (meaning an increase in ship traffic from 180 to 480 annually) as a minor change. Oh, and then there is the fact that the 1997 permit authorizes the shipment of “grains, petroleum coke, iron ore, sulfur, potash, and wood chips” with no mention whatsoever of coal as a primary export product. As far as public comments regarding the scoping process and the EIS are concerned, because the legality of the permits that have been filed is an open question, we encourage you to wait to comment on the project to county officials until the public comment period is announced during the scoping process. Once the public comment period for scoping is announced, it means that the county has accepted the permit application. This is not currently the case.